When I heard that President Macron was ready to whisk Lebanon’s kidnapped prime minister to Paris with his family – victims of the gentlest hostage-taking in the history of Saudi Arabia – I couldn’t but recall what Saad Hariri said to me a few years after he first became Lebanon’s premier in 2009. I was sitting in his office in his Koreitem Palace – a vast, ugly monster of a building not far from the Hamra district of Beirut – and I asked him if he liked being prime minister of Lebanon. He had only two advisers with him. “I am following in my father’s footsteps,” he said repeatedly. He was talking about his father Rafiq, the former Lebanese prime minister murdered in Beirut four years earlier, in 2005. But he was always talking about his father’s footsteps and people mocked him for this. But really, I asked again, what did it feel like to be prime minister of Lebanon? His answer quite shocked me, though it should not have done. “You know this is my duty,” he said. “But I miss Saudi Arabia. I miss being able to take my family out in the car and drive through the desert at night and feel the desert wind in our faces – and us, just alone. No policemen, no security, no soldiers.” Well, I guess that from now on, he’s going to associate Saudi Arabia rather than Lebanon with policemen, security and soldiers. But it was an interesting reflection on the Hariri family. I knew his father rather better. When he was assassinated with 21 others by a suicide bomber on the Beirut seafront in 2005, I saw Rafiq Hariri’s body lying on the roadside. He was a plump man and I thought at first he was the man who sells thyme bread on the Corniche until I saw the hair over his collar. His socks were on fire. With a colleague, I had first met Rafiq Hariri not in Beirut but in Riyadh, the Saudi capital where his son is now incarcerated, albeit in the luxury to which the family was and still is accustomed. The comparatively young Rafiq – this was in the 1990s, before he was prime minister – was sitting in his office complex, headquarters of the now bankrupt Oger company, indulging in the irritating habit so beloved of Arab businessmen: talking to advisers while glancing constantly at a vast television screen to distract him from the conversation. Ah, but that was the problem. Rafiq Hariri was always hobbled by Hezbollah’s growing political ambitions. He once expressed his fury to me after Hezbollah’s leader, Sayed Hassan Nasrallah, decided to build a tomb for his martyrs opposite the entrance to the spanking new glass and steel airport which Hariri had built to the south of Beirut. “Can you imagine?” he asked. “This man was going to put the bodies of Hezbollah men killed by the Israelis right opposite the entrance to the international airport, the first thing tourists would see when they arrived.” Hariri stopped the plot. The world – which then meant the United States – accused the Iranian-funded Hezbollah of murdering Hariri, and so when Saad became prime minister, he too feared the Hezbollah, though many (including myself) had doubts about just who his father’s murderers really were. And with Hezbollah’s ministers in the government – freely and fairly elected, we should add – Saad Hariri found himself in a different kind of danger when he immediately returned as prime minister last year. As a Sunni citizen as well as a Lebanese citizen, the Saudis expected him to tame the Shia Hezbollah. But he had to rule a united Lebanon, not lead it into another civil war. 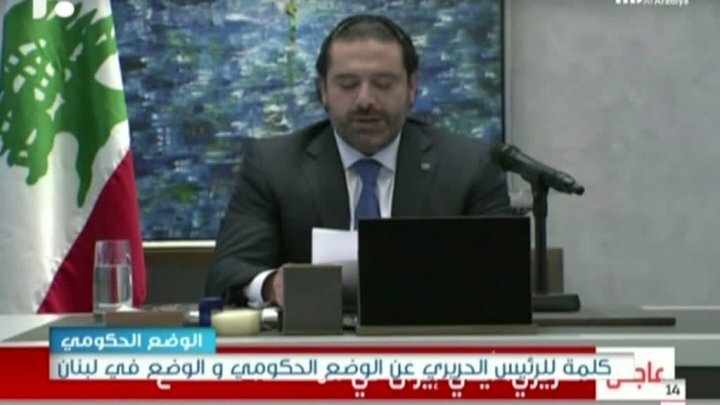 So when 32-year old Crown Prince Mohamed bin Salman of Saudi Arabia tried to destroy the power of Shia Islam, Lebanon (and Hariri) were bound to be targets of this dangerous young man’s fury. The prince had tried to destroy Bashar al-Assad’s Shia regime. He failed. He launched a war against the Shias of Yemen. It turned into a disaster. He tried to economically strangle Qatar – because of its close relations with Iran – and liquidate the Al Jazeera channel, and he failed. So now he turned his massive irritation against Lebanon. It looks as if this too will be a dismal failure – thanks partly to President Macron. And not least because Hariri also happens to be a French citizen, whom Macron can therefore justifiably stand up for. Macron wants Hariri’s wife and two children to accompany him to Paris – so there are no more hostages left behind. But there are. There’s his brother Bahaa, for a start. Despite all its verbal frothing, the one thing the Saudis will not do is attack Iran itself. That would be far too frightening an enterprise for the Crown Prince to undertake. But it’s worth remembering how much Saad Hariri liked – and quite probably still does like – Saudi Arabia. As his father did. Not long after Saad expressed to me his longing to drive through the Saudi desert at night, far from Beirut, he also replied to a question of mine about his political ambitions: “Five years in Lebanese politics – and then I’ll be gone,” he said. It was eight years before he was forced to read his “resignation” speech in Riyadh – and then he almost was “gone”. For it now transpires that a number of EU ambassadors in Riyadh seriously feared for Saad Hariri’s life after he read his infamous and scripted speech. Others fear for the future of the Saudi foreign minister and former Saudi ambassador to the US, Adel al-Jubeir, who must surely have tried to advise the Crown Prince not to coerce Hariri. If he gave such advice, it clearly went unheeded. When al-Jubair later appeared on television, his eyes – in the words of a close acquaintance of the Hariri family – “stood out on stalks”. But Hariri himself remains dissatisfied with some of his closest advisers in his own Future movement in Beirut, which is itself funded by the Saudis. No one will say just whom he suspects of preparing to stab him in the back. Some might guess Fouad Siniora, the enormously gifted economist and academic usually regarded as a loyal friend – and certainly no Dr Faustus. I’ve always liked Siniora. He stood up for Hariri’s father Rafiq when Hariri enemies tried to suggest there had been corruption in Rafiq’s Lebanese government. But Beirut politics is even more slippery than the Saudi version – sometimes more dangerous, though that might soon change. When Saad Hariri was taken from Riyadh airport by Saudi security men that first night in Riyadh, he at first found himself only a few hundred feet from the Riyadh Ritz-Carlton hotel in which dozens of princes, rivals of the Crown Prince, were already detained for “corruption”. He must have wondered if he was about to join them. Then, indeed, the freedom of the Saudi desert wind might not have seemed quite so attractive.